While most local people are familiar with the infamy of this former Old Town mill, it occurred to the Hebden Bridge Web that many young people and newcomers to the area do not about know this local tragedy. 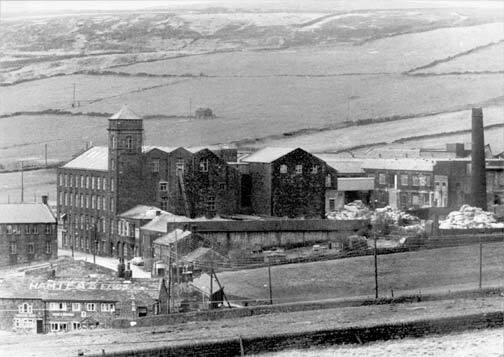 Hundreds of people in the Hebden Bridge area have died from asbestos related cancers, mainly contracted from working at Acre Mill. Below, we have tried to include pieces related to the Acre Mill story, the dangers of asbestos, how the guilty companies must have been aware of their murderous activities and of the victims’ long fight for justice and compensation. We hope that this feature might provoke feedback, and will develop it as we receive responses. If you have views on these matters, email us. 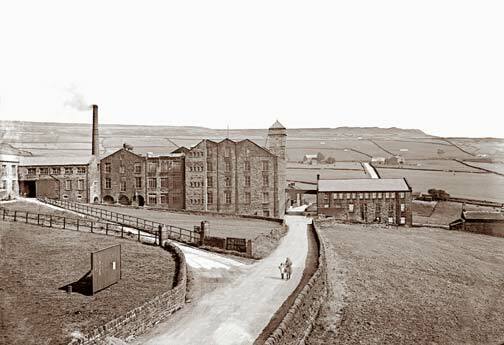 The asbestos processing company moved into Acre Mill, Old Town, Hebden Bridge in 1939 to meet the demands for producing filters for gas masks during the Second World War. In 1970, the company moved to Westmorland. In the 1970s, deaths of many people who had worked at the factory began to cast doubts on the company’s safety record, and the Department of Health conducted a public enquiry into the matter. The company dumped asbestos waste at Heptonstall, Pecket Well, and Mount Skip. Since 1975, the Hebden Bridge Asbestosis Action Group has been campaigning for the Scout Road tip to be made safe. In 1978, Hebden Royd Town Council proposed that the tip should be converted into a picnic site. The mill was sealed off and demolished in 1979. In March 1976 the Ombudsman, Sir Alan Marre, revealed the horrors at a factory in Hebden Bridge… 12% of a total of 2,200 employees had crippling asbestos diseases by 1979. The Government immediately launched an enquiry, the Advisory Committee on Asbestos… The asbestos industry launched a 11 million advertising campaign against the ‘unwarranted, biased and inaccurate’ comments on the industry. At its peak, Cape’s operations were worldwide and large enough to make it a major player in the asbestos industry. In the mid-1970s, the company boasted that it was “one of the principal producers of crocidolite and the world’s chief producer of amosite asbestos.” Cape and its subsidiaries had holdings in South Africa, Italy, France and Germany. At Cape’s facilities in London, Hebden Bridge, Uxbridge, Manchester, Glasgow, Newcastle, Liverpool, Belfast and the Isle of White, asbestos from its South African mines was turned into a wide range of products including asbestos yarn and cloth, millboard, webbing, insulation mattresses, pre-formed thermal insulation, sprayed asbestos thermal and acoustic insulation, filtration materials, asbestos cement flat sheets, corrugated sheets, pipes, molded products, slabs, packings and rope lagging. Extracts from 1929 reports by C. Leonard Williams, the medical officer of health for Barking Town Urban District Council, are illuminating: the presence of asbestos dust in the lungs produces a definite disability decreasing the expectation of life that the conditions under which certain of these cases have been working have been such as to permit the inhalation of asbestos dust, with consequent pulmonary disability. That year, Williams reported three cases of asbestosis from the Barking factory. Sixteen years later, he sadly reported, I am firmly of the opinion [that] it [asbestos] is a deadly and dangerous commodity, and that unless those who are charged with the responsibility of safeguarding the health of the people in the industry can give positive assurances that they have now after all these years removed every possible danger, the processing of asbestos, except so far as its products are essential to the national economy, should be barred. Laurie Kazen-Allen who has campaigned tirelessly for many years for an asbestos ban, also produces the British Asbestos Newsletter. Over the Pennines, in the old industrial heartlands around asbestos manufacturing sites like Hebden Bridge, the geography of the area has been scarred by the legacy of this fatal fibre - with 924 deaths across West Yorkshire. Looking back in the light of present knowledge, it is impossible not to feel that opportunities for discovery and prevention of asbestos disease were badly missed. Thomas Legge, ex Chief Medical Inspector of Factories, in Industrial Maladies 1934. …From 1964 to 1975 the media in both the United States and the United Kingdom kept asbestos high on the political agenda (Sunday Times, 1965). The ITV programme The World in Action in 1971, and the BBC Horizon in 1975, about conditions at Cape’s Acre Mill asbestos plant in Yorkshire, United Kingdom, helped to initiate action by authorities, such as a Parliamentary Ombudsman Report into asbestos regulation enforcement at the factory. This report was initiated by local MP Max Madden, who lodged an official complaint against non-enforcement of the asbestos regulation of 1931. The report was very critical of the Factory Inspectors, and the government responded by appointing a government inquiry, the Simpson Committee, in 1976. Meanwhile, the 1931 asbestos regulations had been updated in 1969, and a limit for factory asbestos dust exposure of 2 million fibres per cubic metre (m3) of air was to be gradually introduced. Unfortunately this ‘hygiene standard’ did not include consideration of the lung or mesothelioma cancer hazards. It was later to be strongly criticised and associated with high asbestosis levels (one worker in 10 would get the disease) by Julian Peto in evidence to the Simpson inquiry (Peto, 1978). Asbestos and Your Health: Why is asbestos dangerous? A disabling and ultimately fatal scarring of the lungs causing severe breathlessness and chest pains. The term was first used in 1924 by Cook in the British Medical Journal. The destructive effects of asbestos cause the slow replacement of healthy lung tissue, responsible for the exchange of oxygen and carbon dioxide, by fibrous or scar tissue, which cannot ‘breathe’. Lungs have a natural reserve capacity which means the disease will develop over many years without any symptoms showing. By then the damage is well and truly advanced. The victim will be short of breath, unable to walk very far, will have coughing, general weakness and chest pain. The damaged lungs strain the heart and can lead to congestive heart failure. X-Rays detect the damage at an early stage: a routine medical examination will not. Often a fine fibrosis is seen at the base of the lungs unlike the effects of other silicas. This disease is most common among those who have had regular and high exposures to fibres: laggers, asbestos textile workers, and those involved in the manufacture of asbestos products. There are, however, documented cases where relatives of workers have died of asbestosis and where people have worked for only short periods in the asbestos industry. Because controls reducing fibre levels and bringing in respiratory protective equipment were introduced in these high risk areas many years ago asbestosis should now become less frequent. A painful and nearly always fatal disease. The evidence that asbestos could cause lung cancer was available in 1934. In the early 1940s there were reports in Germany. In 1949, the Chief Inspector of Factories reported finding lung cancer in 13.9% of UK asbestosis cases. This increased risk of lung cancer was then confirmed epidemiologically in 1955 in Britain by Doll. Lung cancer is generally associated with smoking. Recent figures by the Cancer Research campaign show that in the UK almost 40,000 people a year die from lung cancer, the most common cancer in men, and second most common in women. Smoking is assumed to be the main cause, but Peto’s figures show that some 6,000 lung cancers a year may yet prove attributable to previous asbestos exposure. In 1966 a US study estimated that the risk of lung cancer in a non-smoker exposed to asbestos is five times the expected rate. Smoking alone would increase the risk of lung cancer by a factor of 11. Asbestos and smoking together would increase the risk to 52 times that prevailing in the general population. The International Agency for Research on Cancer has quoted a study of asbestos workers suggesting that asbestos workers who smoke have eight times the risk of lung cancer as compared to all other smokers, and 92 times the risk of non-smokers not exposed to asbestos. A rapidly fatal and painful cancer of the lining of the lung (pleura), the abdomen (peritoneum), or heart (pericardium). Until the 1960s this form of cancer was unrecognised. More than 10 times as many deaths are due to pleural mesothelioma than to peritoneal mesothelioma. Some people develop both. The lung walls thicken because of the scarring caused by asbestos. This is seen on X-ray examination. Extensive thickening may cause severe shortness of breath. It can be described as on one side of the lungs, or both sides (bilateral) or it can be described as widespread (diffuse). According to Julian Peto, Every single person in the UK has some asbestos in their lungs. It is the level of exposure and the frequency that’s important. All the established cases (of mesothelioma) so far have been due to high and regular exposure. What we don’t know is if the lower levels due to environmental exposure cause mesothelioma. Since the risk to men is six times higher than the risk to women (who are seldom exposed to asbestos at work), environmental exposure is clearly not as significant as occupational exposure. There is a great deal of resistance to the idea that low level exposure to asbestos is a risk to health. In actual fact people with evidence of lower levels of exposure to asbestos are develop mesothelioma but they then have a harder time gaining compensation because experts go into court and say the environmental risk is negligible. It is not natural to have asbestos in your lungs. If it is truly the case that everyone now has some, then the prospects are terrifying given the long latency for the diseases. Asbestos Chapter 13 "Asbestos: The Evil History"
Catalogues the important dates in history which might have signified the dangers asbestos posed from the 1st Century AD to 1995. 1976 The Ombudsman, Sir Alan Marre, revealed the horrors of the massacre at Hebden Bridge. 12% of employees had crippling asbestos diseases. The Government launched an enquiry, the Advisory Committee on Asbestos. Builders are particularly at risk of exposure to asbestos. Doctors estimate that up to a quarter of a million men in Western Europe will die from an asbestos-related cancer in the next 35 years. Professor Julian Peto of the Institute of Cancer Research and the London School of Hygiene and Tropical Medicine predicted a European epidemic in mesothelioma, a cancer of the lining of the lung caused by exposure to asbestos. Deaths from the disease are expected to rise from just over 5,000 in 1998 to about 9,000 by 2018. There is no effective treatment for the illness and few people live more than three years after getting it. Building, engineering and shipyard workers are at the highest risk and nearly all victims are male. The high number of cases of mesothelioma in men born around 1945-1950 reflects the large amounts of asbestos used in the 1960s and 1970s when they were beginning their working lives. We are only beginning to see the effects of this as the disease usually takes between 20 to 60 years to develop, Professor Peto said. Thanks to Frank Woolrych of the Hebden Bridge Local History Group for making this photo available: it was taken in the seventies by an unknown photographer. I was unaware of the dangers posed by asbestos until, in the early 1970s, I saw a moving television documentary called Alice — A fight for life , which told the story of Alice, who was brought up in a terraced house in Hebden Bridge in the west riding of Yorkshire. As a child she had played in the streets with asbestos, making ‘snowballs’. The asbestos had been emitted by Acre mill, nearby, and after a long and vitriolic legal struggle, Turner Newall — or Turners Asbestos, as it had been — eventually paid her compensation related to the asbestosis from which she died shortly afterwards. My name is Patsy Jefferson. My mum was Alice, in the documentary Alice, a Fight for Life. I was 5 years old when I lost my mother to this terrible illness. I am glad my mum didn’t die in vain, I am glad she has not been totally forgotten. That was the sole reason she made that program, to show the public what a dangerous substance asbestos is and to make the companies that used this stuff come out of the woodwork and take responsibility for the loss of life of many people in the local area. I feel very strongly that we should keep this subject out in the open, so we never let anything like this happen again. I think there should be some sort of a memorial at the site that was once Acre Mill for people to see and remember. We cannot afford to stop remembering. A quarter of a century later, the anniversary of the screening of the award-winning documentary is being marked by a campaign to raise funds for research into mesothelioma and asbestos-related cancers. I have just been reading your article on the web regarding Acre Mill. I found it interesting having lived overlooking the mill all of my unmarried life. I lived at the old cottages above the bowling green Rock cottages. As a child I went to Old Town school and used to play by the mill. My mother father, brother and myself all worked for awhile there. I worked just a short time in the disintegration room. One of the most dangerous dirty jobs in the mill. As yet I do not appear to have had any effects from the time I spent there. I do believe both my mother and dad died from working in the factory. We were not as aware then as we are now of the danger of the work. I hope this helps to add to your information on Cape. They did have a good social side to help at the time. Willie Bamford. World In Action: The Dust at Acre Mill (1972) - filmed in Hebden Bridge, with interviews with formers workers of Acre Mill.